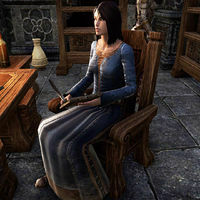 Chancellor Regina Troivois is a Breton civil servant for King Emeric, and a member of the Department of Interior Affairs. She is the author of two reports for King Emeric—House Tamrith: A Recent History and Northpoint: An Assessment. The chancellor resides in Wayrest's castle, in the room to your left as you enter. If spoken to, she will ask, "Yes, what is it? If you don't have business with the treasurer, I would suggest you be on your way." This page was last modified on 2 January 2017, at 19:54.